Cardiac arrest kills nearly 9 in 10 victims—we’re helping people beat those odds. We're helping people survive cardiac arrest with an innovative emergency response effort. As a nationally ranked heart and vascular center, we're among a few places in the country leading the way in cardiac arrest care. We're testing new ways to treat the condition, and we're getting results. More people are leaving the hospital to return to their loved ones, their work, and their lives. Our new approach is called an ECPR (Extra-Corporeal Cardiopulmonary Resuscitation) alert. Today, when a cardiac arrest victim's heart stops, if they're not inside a hospital, the chance of survival is less than 10 percent. The new ECPR alert is changing that. "For people who are in ventricular fibrillation or refractory ventricular tachycardia, which are irregular heart rhythms that don't sustain life and resist being shocked back to normal, this can be the difference between life and death," says Dr. Ernest Mazzaferri Jr., medical director of Ohio State's Richard M. Ross Heart Hospital. "Typically, if they were unresponsive to shock, the patient would die, simply because we didn't have any further options that might save them. Now, under the right conditions, we do." Our heart doctors work with Columbus Division of Fire on a carefully planned chain of events. 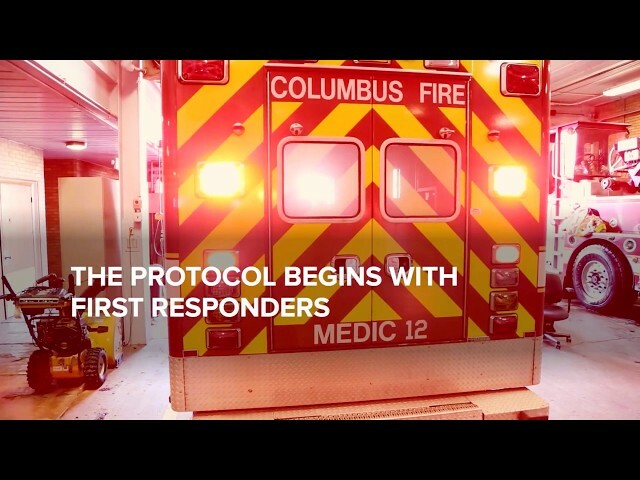 First responders follow their protocol for sudden cardiac arrest. If the deadly heart rhythm remains, they call an ECPR alert to Ohio State. Medics use a mechanical CPR device on the patient and head straight to the cardiac catheterization lab, where Ohio State's team is ready and waiting. "Between the field and the cath lab, it's critical to have good CPR to keep blood and oxygen moving to the brain and essential organs," says Dr. Konstantinos Dean Boudoulas, director of interventional cardiology at Ohio State. Doctors connect the patient to an external system that takes over for the heart and lungs. This seamless process from the field to the cath lab gives doctors a chance to fix what caused the cardiac arrest – a chance they didn't have before. "It's exciting, and very few programs are doing it," Boudoulas says. Mark Bradford, 68, became the first ECPR alert patient in Columbus when he collapsed while on his morning walk. He woke up days later after treatment in the hospital. "Without that protocol, I wouldn't be alive. I'm very fortunate that they were trained in it and used it," Bradford says. So far, available data shows an increase in survival from under 10 percent to about 40 percent. We're still testing, but Ohio State doctors are already helping other hospitals launch their own ECPR alert programs. The benefits are far too important not to share. Our hope is this treatment plan will eventually become widespread, allowing more people to survive cardiac arrest and get back to a meaningful life. A life they might never have had, but for this groundbreaking work.